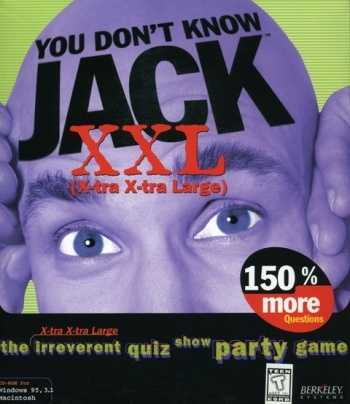 The beloved and irreverent game-show videogame You Don't Know Jack could be making an encore appearance after a decade of silence. If you don't know You Don't Know Jack, you might be forgiven considering its age: It was a series of game show games that boasted a melding of "high culture and pop culture" that ran on various platforms from 1995 until 2000. For those who owned and played it, it was a genuine blast. Now, a whole new generation can be exposed to the thrill of Screwing (literally, Screwing) their opponents: Jack is coming back. Originally announced on the Giant Bomb podcast, the news was confirmed on the official YDKJ site. P.S. More THQ/Jellyvision YDKJ partnership news to come. Stay tuned! So it seems that the revival of the quiz game franchise will be done in partnership with THQ. I have heard worse ideas in my life. Ooh, ooh, maybe they can have a crossover with Relic's Warhammer 40k games? "You don't know Jaccus, so die for the glory of the Imperium!"